This spectacular mid-canopy walkway provides a living link between the Entrance, Coffee Shop area and the Canopy Tower. The Aerial Walkway allows unprecedented access to the mid-level rainforest and offers stunning views over McLean’s Creek. Constructed with visitor safety and comfort in mind, the walkway enables wheelchair access to both the Interpretive Display Centre and the base of the Tower. 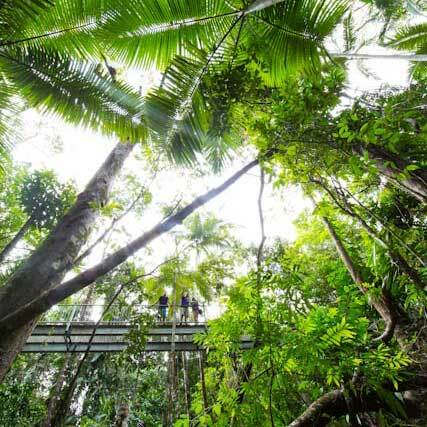 At an impressive 11m High, This Daintree Rainforest Skywalk is rated as one of the Top Ten Skywalks in the Country By Australian Geographic!